Et in arcadio ego: "Les Caprices des Dieux" in an installation space of manifold possibilities. In the Arcadian fields of the timeless present, shepherds discover a nearly illegible, weathered script on a sarcophagus making them realize that, even in this seeming paradise, death is omnipresent. Thus we are reminded that every life, every moment be it ever so sweet is ruled by ephemerality. As agent provocateur and impresario, Simon Beer creates elegant, even precious, and sometimes cool installations needing the sublime gesture to, for a short time, be capable of pursuing their capricious mischief. In juggling with various media – painting, graphic design, photography, video, object art – he performs a conceptual tightwire dance, giving wing to human hearts with their yearnings and desires. In the installation Castor & Pollux, Beer focuses on the Castoress, protectors of threshholds and gods of passageways, comparable to Janus. Like him, they simultaneously look to the east and to the west. Surrounded by water (a spring), this attribute is reminiscent of the fistfight between Pollux and Amykos. After the challenger was bound and tied (death), the Argonauts could lap up his spring water to survive and challenge their own fate. For the exhibition "art en plein air," the protagonists, both in snowman guise, represent those contemporary gods of Roman mythology who simultaneously unite the "underworld" with the divine, thus furthering the apotheosis to which they aspire. Castor & Pollux is installed in front of a 200-year-old stone bridge which divides the village of Môtiers in two. 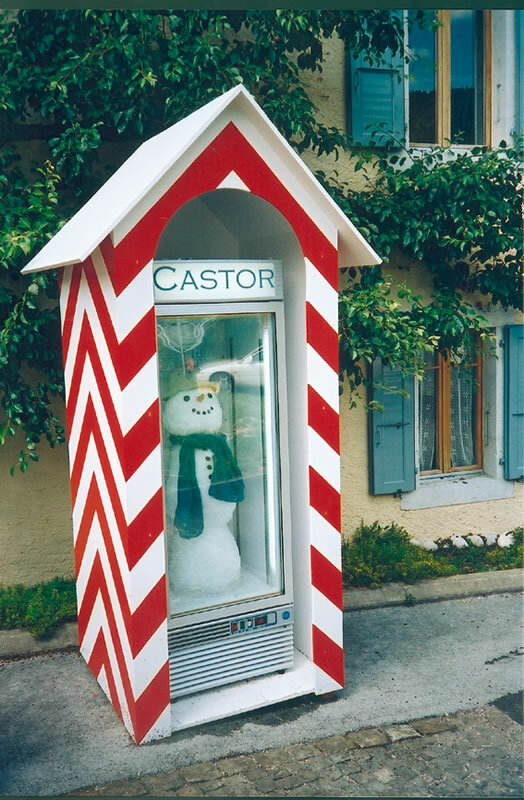 The installation is made up of two guardhouses of the type that used to be seen at the entrances to military barracks and two freezers with glass doors and interior lighting, each filled with a snowman (Castor & Pollux). 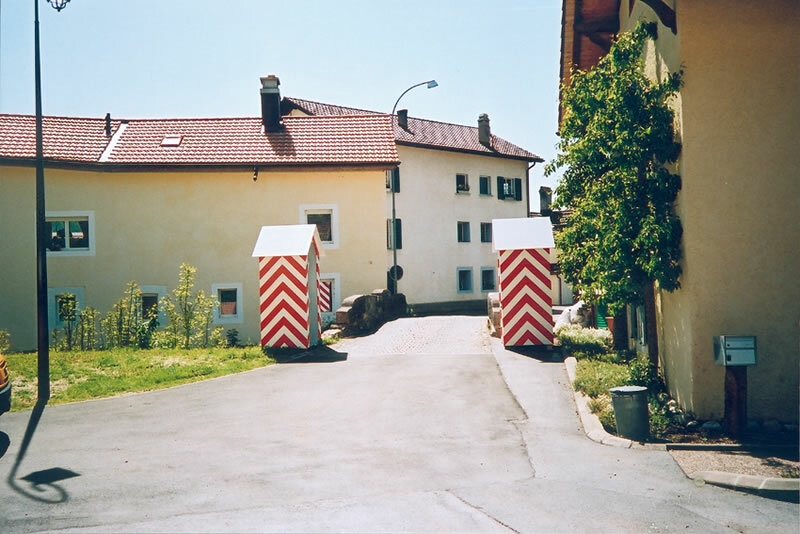 The freezers are placed in the guardhouses with glass doors to the front, emphasizing the guarding function of the snowmen who inhabit these wooden structures. One faces east, the other west. Both snowmen, as ephemeral sculptures representing the two protagonists, are made with snow from the Grimsel Pass and transported to Môtiers. Both freezers attempt to spite seasonal heat during the exhibition period, thus allowing both heroes to survive the summer. Pollux, detail guardhouse with plastic curtain, facing south. 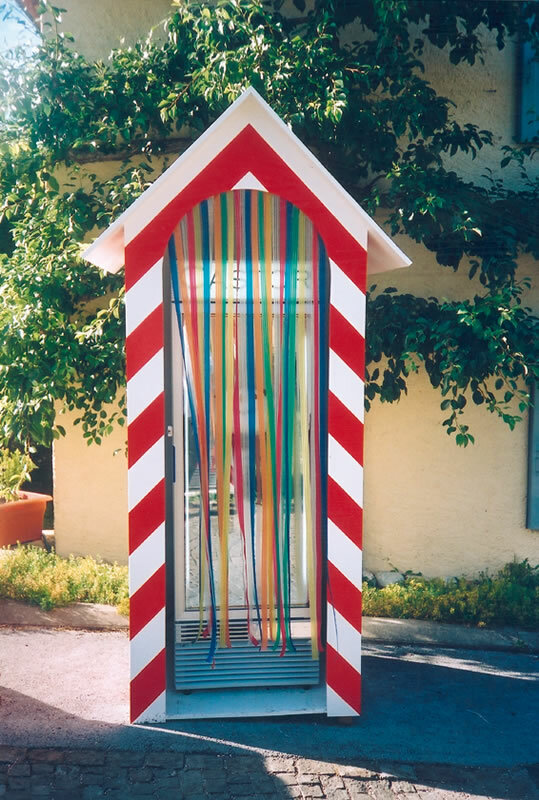 Castor, detail guardhouse before hanging of plastic curtain. Complete view of installation from east. In the background is the 18th-century stone bridge. 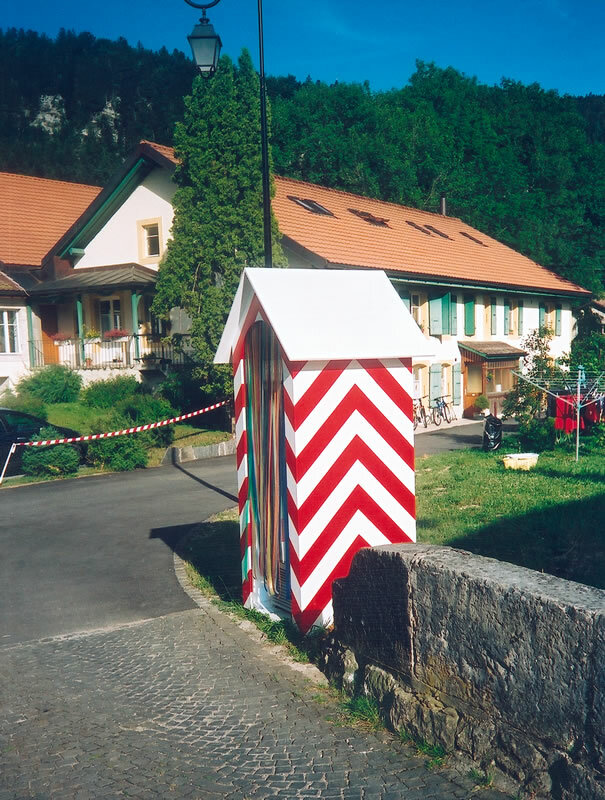 Guardhouses painted white/red; transfer lettering; freezers; snowmen, three parts each; scarves; caps; buttons; carrots.